“COUNTRY ROAD” is an original oil painting by David McClain, resident of the Sunshine State, Florida. David is dependent on a wheelchair. 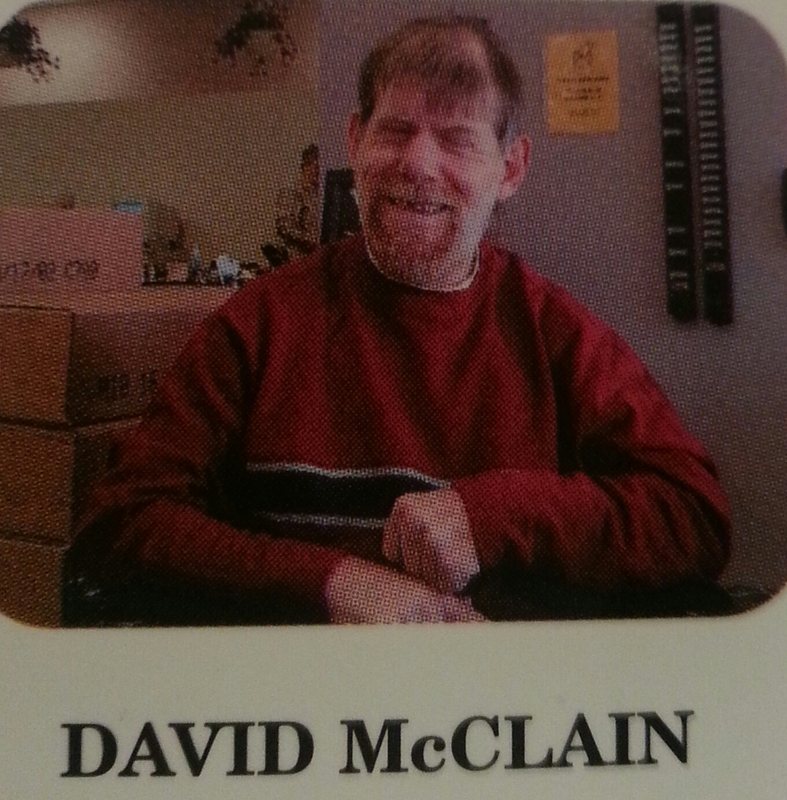 David also works in shipping and packaging in our offices. This greeting card was reproduced from an original artwork by David McClain for THASC Sales Co. which has employed a unique group of handicapped artists who create art to help rehabilitate themselves. They gain self-respect and pride through their artwork. Autumn is that wonderful time of year when we yearn to take those road trips down lost country roads just to “ooooo” and “ahhhh” at the magical colors that “Fall’s Fashion Show” begins to reveal, or in many cases, has fully peaked with its bright orange, red and yellow signature colors. What makes these road trips so much more exciting is searching out a romantic structure from the past, that is, just coming across a covered bridge. At one time covered bridges were used for courting and got the name “Kissing Bridges” for those in love. 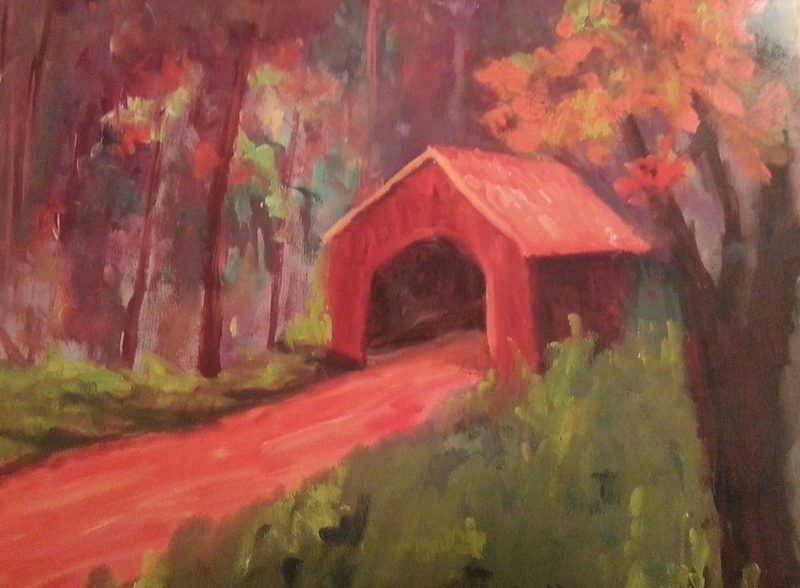 THASC artist David McClain brightens our way with his brilliant red road leading us to the covered bridge. This brings me back to the days my dad would take us on a road trip to see the foliage and discover the bridges along the Mohawk Trail. 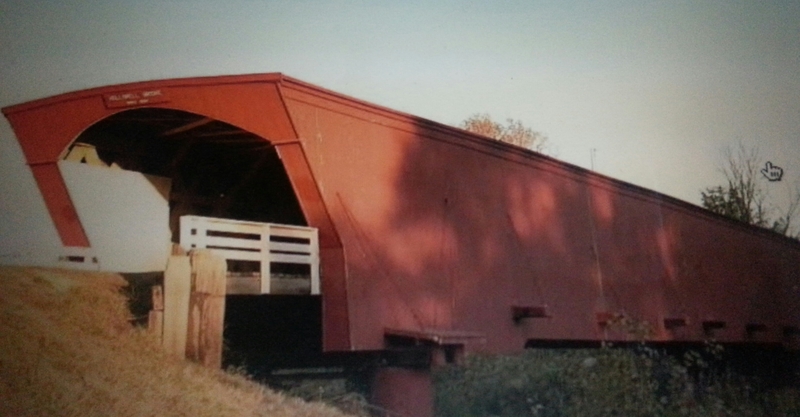 As an engineer, my Dad explained that the roof and walls of covered bridges helped to strengthen them. The biggest reason for strengthening the wooden structure was, obviously, protection from the weather, as the elements would make wooden bridges more slippery and be more apt to fail much faster. Wooden bridges were also covered to protect pedestrians and to keep animals such as horses and cattle from being scared by the rushing waters below. The Arthur A. Smith Bridge was originally constructed in 1870 and named for a Civil War Army captain in the village of “Olde Colraine” in Massachusetts. David’s portrayal is definitely showing us peak foliage in his painting “Country Road”. With the autumn foliage as a backdrop also in the photo below, a walk through the bridge is a must, especially to see the support arches on each side. Other covered bridges that are brought to mind by David’s painting are the ones used in Clint Eastwood’s film “The Bridges of Madison County”, which perhaps some of you, like me, found to be a very romantic setting. Of the 19 covered bridges built in Madison County, Iowa, during the late 19th century, only 6 remain. 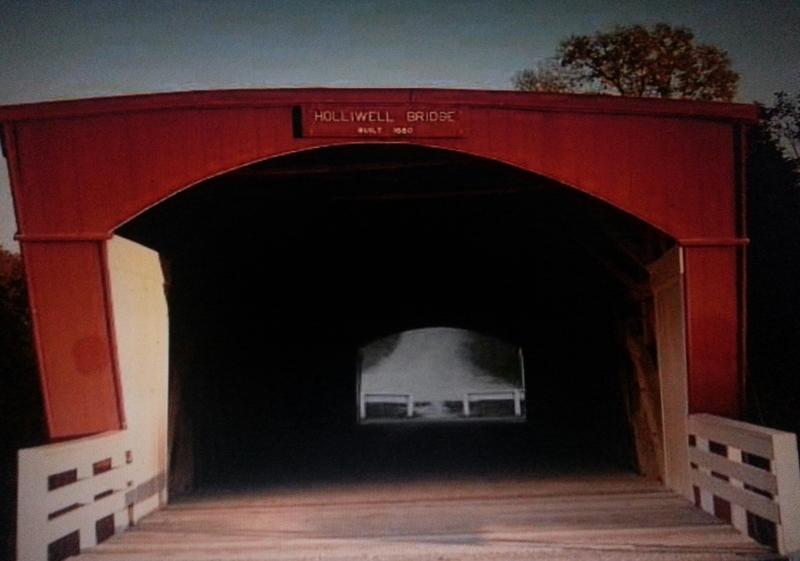 Specifically, the Hallowell Covered Bridge (which by the way is the longest covered bridge) built in 1880 is where the protagonists Francesca and Robert meet up in the novel with of the same name by Robert James Waller. 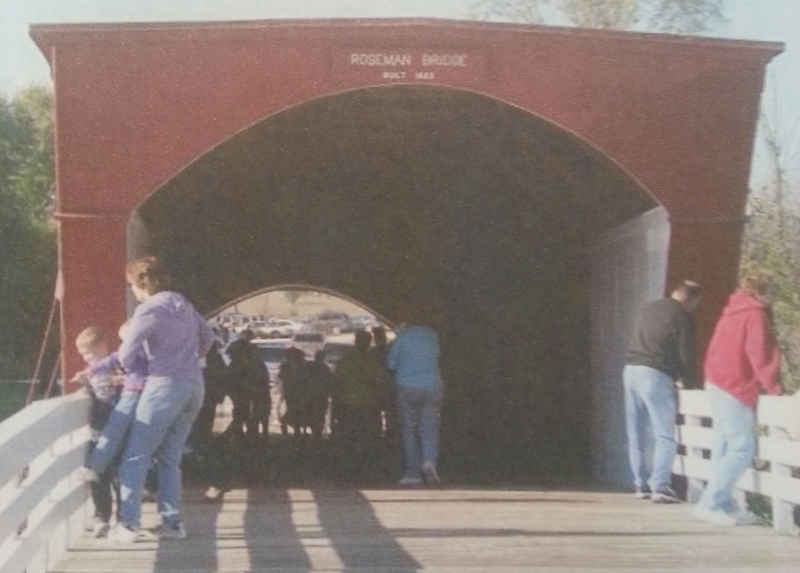 The second bridge filmed in the movie is the Roseman Covered Bridge where the spreading of the ashes took place. Today even though covered bridges serve no modern day purpose, they are all considered historical landmarks. David McClain’s inviting painting excites many of us, especially in the Northeast, that it’s close to leaf peeping time and also that it’s the time for reminiscing about those years when covered bridges stole our heart. See you on Thursday. Please feel free to leave a comment and I will reply right away, thanks! THASC is a unique small American business producing cards & other promotional products. And orange leaves. I wish we had covered bridges In RI,or maybe theres once I don’t know of. Well, you must of had a special time driving with your dad,to see the foliage,and the bridges. I wish l could of gone with my father on a road trip,to see the foliage, and the bridges. That would have been somethibg to ohhhh and Ahhhh about, just having my father with me on the road trip would have been really special,l would have loved that. David McClains painting ls really pretty. It makes you think of two people ln love, just sitting under the bridge. Keep up the good work David,and make more bridge pictures!Maria,we have to take a country ride someday and look at the leaves changeing colors,In honor of Sara. I did not know how many gifted, handicapped artists are out there producing such beautiful work. I operate a custom furniture shop and my caner, blind from birth, does amazing work. Knowing him for many years I forget he is handicapped, he seems “normal” to me. But when I see the work he accomplishes, as with these paintings done by others who have limited use of their hands or their arms, I am awestruck. David McLean’s covered bridge seems more real than the actual bridges in the photos. His painting shows us what to look for. I didn’t even get past the title and picture of the painting without automatically thinking of western MA. I’ve been up and down the Mohawk trail so many times and love it in the fall. I recognized the bridge in Colraine right away. I was unaware of its history though. 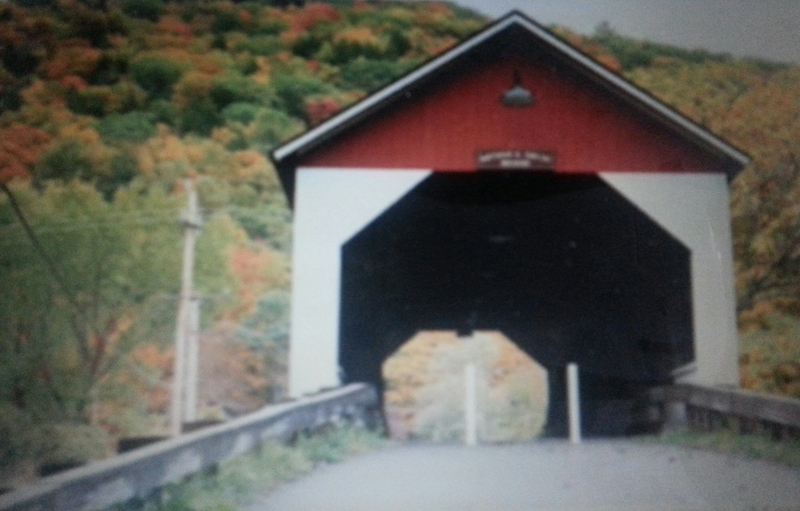 Western Ma and the Berkshires have so many covered bridges and scenic roads. I love taking day trips along all the backroads, getting ‘lost’ in the mountains and discovering all the hidden gems western MA has to offer. Old covered bridges and barns are among my favorite things to stumble upon. It’s like taking a trip to the past. Love this painting! I am deeply touched by your comment and your knowledge of western MA.Thank you so much for taking the time to write a comment. It was very informative and I hope to have more comments here from you on Tuesdays and Thursdays. Grazie!! !